The National Weather Service reported that wind gusts as high as 85 mph were observed from the Bering Sea storm at Tin City, Alaska. 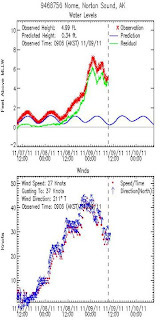 The maximum gust at Wales was 84 mph. 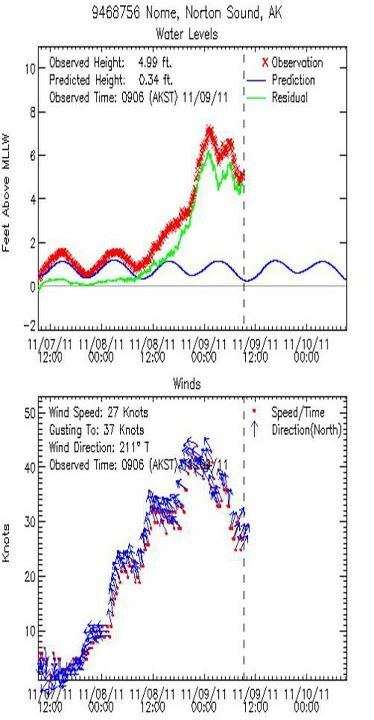 Waves as high as 40 ft. were reported in the Bering Sea. The storm moved over the northeastern tip of Russia early this morning with a minimum barometric pressure of 946 mb., heading into the Chukchi Sea. This makes it "one of the deepest systems in recent history to move through the Bering Sea." A National Weather Service Special Weather Statement issued within the last hour warns of an "EXTREMELY DANGEROUS AND LIFE THREATENING STORM OF AN EPIC MAGNITUDE RARELY EXPERIENCED" for the west coast of Alaska. Over the Bering Strait coast and St. Lawrence Island, sustained hurricane force winds with gusts as high as 90 to 100 mph are predicted. 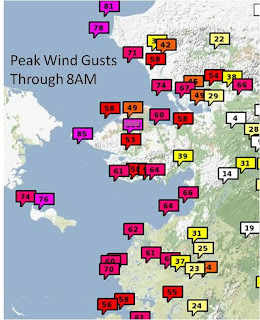 Wind gusts have already been reported as high as 45 mph at Kivalina and 55 mph at Point Hope on the Chukchi Sea. The storm moved past the western Aleutians around 3 am AKST this morning and is expected to move past the Bering Strait tonight. 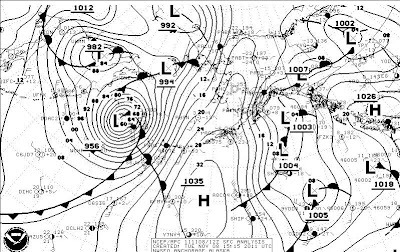 The surface weather map (above) from this morning shows a rapidly deepening 956 mb low of bomb proportions, down 24 mb in the past 18 hours. 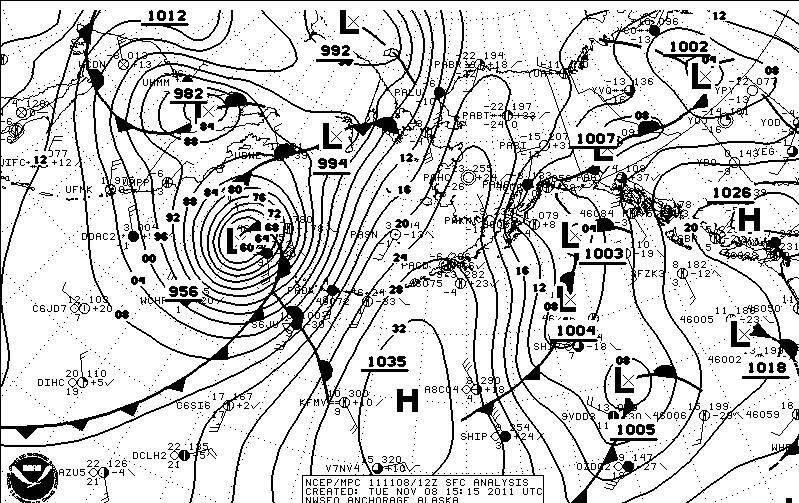 RECORD MAGNITUDE IS BEARING DOWN ON THE WEST COAST OF ALASKA. THE STORM WILL TAKE A NORTHWESTWARD TRACK INTO THE CHUKCHI SEA. OF AT LEAST 50 TO 60 MPH. HAS THE POTENTIAL TO PRODUCE WIDESPREAD DAMAGE. EXPECTED ALONG THE CHUKOTSK PENINSULA AND IN AREAS NEAR KOTZEBUE. SEA...AND TO 15 TO 25 FEET OVER THE NORTHERN BERING SEA. ICE IN NORTON BAY ON SHORE. BEACH EROSION AND COASTAL FLOODING. IN PARTS OF THE INTERIOR SEWARD PENINSULA. SEA AND THE WEST COAST. AND WEDNESDAY AT NOME IS EXPECTED TO BE 10 FEET. FOR SAINT LAWRENCE ISLAND AND THE BERING STRAIT COAST. INCOMING SURF. THIS WAS NOT SO IN THE 1974 STORM. Images (click to enlarge): Arctic sea ice extent, November 5, 2011, from National Snow and Ice Data Center; GFS model forecast weather map for northern Pacific and Alaska, November 9, 2011, from NCEP/National Weather Service. See update for later information. 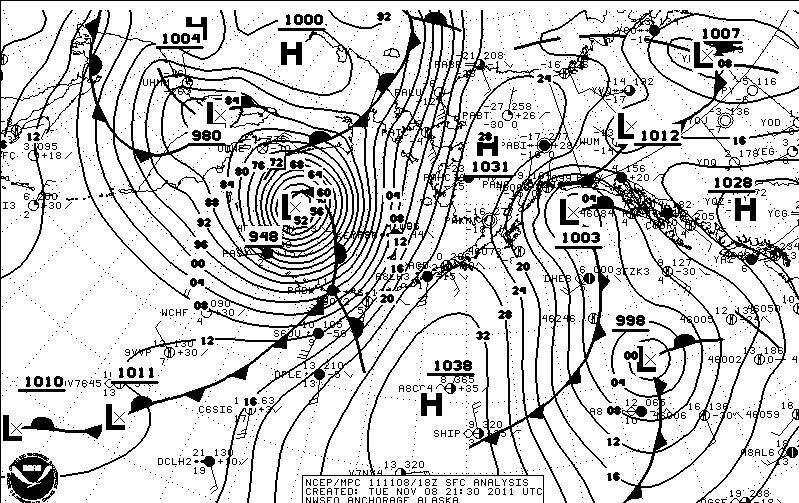 CENTER CROSSED THE ALEUTIANS NEAR THE INTERNATIONAL DATE LINE. ICE TO PROVIDE SOME PROTECTION TO THE COAST. POINT HOPE ON TUESDAY NIGHT. LOW NUMBER 2 IS GOING TO BE A DANGEROUS STORM. The top image shows the Arctic ice extent as of yesterday, November 5. The southern edge is well north of the northern coast of Alaska, leaving the Bering Sea, Norton Sound, and Chukchi Sea along Alaska's west coast ice-free. The second image shows an output weather map from the main U.S. global forecast model, the GFS. It is a 60-hour forecast for 6 am GMT on Wednesday, November 9. 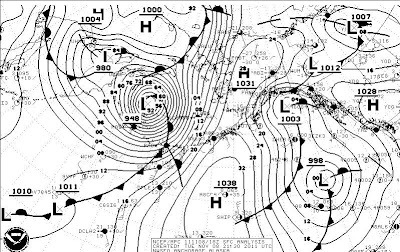 A very strong storm with a minimum pressure of 940 mb is centered in the Bering Sea, moving toward the Bering Strait and pounding the west coast of Alaska with dangerously high winds. 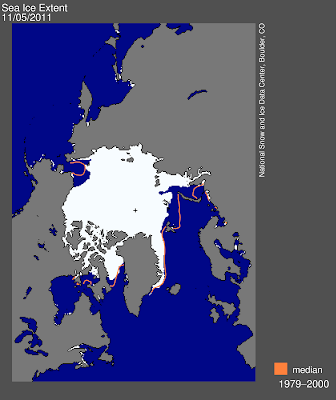 The sea ice extent doesn't need to set a new record in order to have serious consequences.